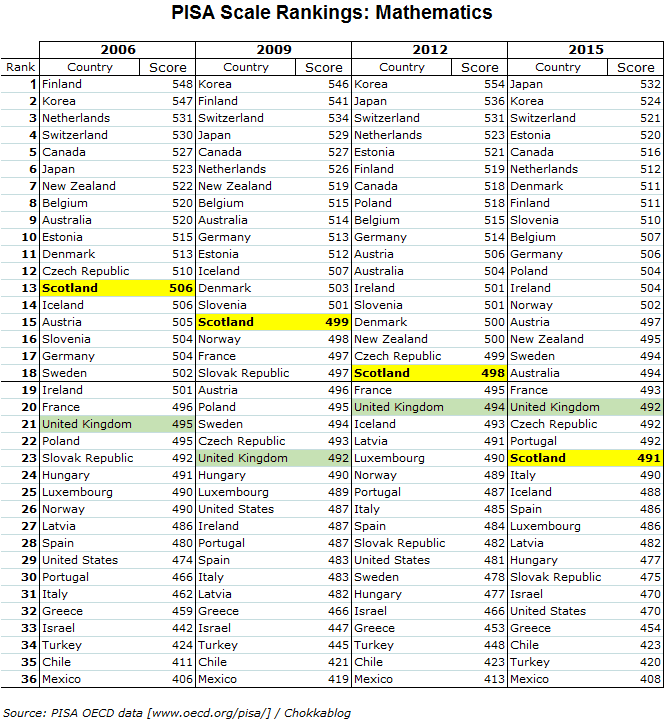 Scottish Education: SNP Neglect or Tory Austerity? 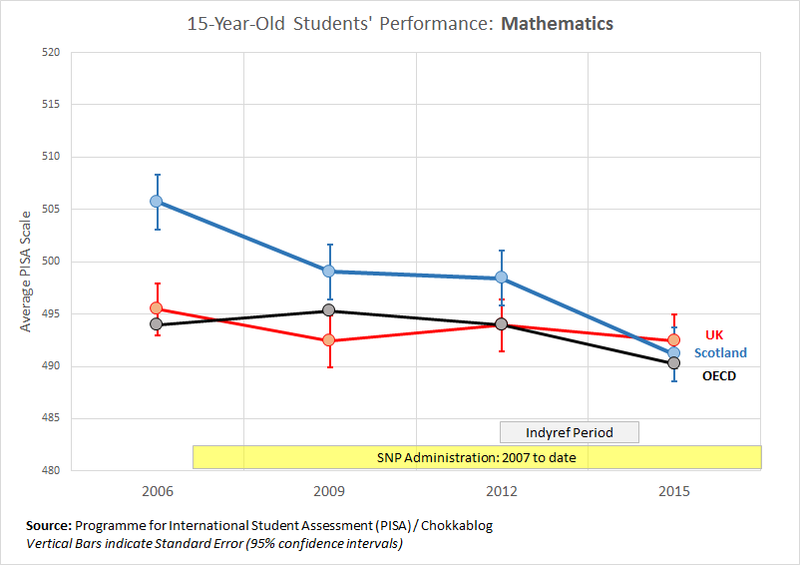 This is not a carefully crafted blog post, it's simply me sharing "work-in-progress" as I dig a little further into the issues underlying the record of failure in Scottish education. 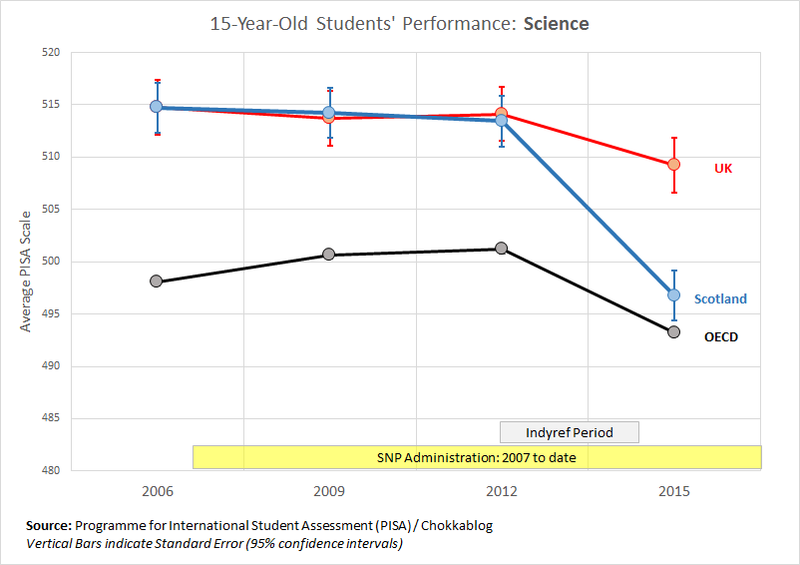 I'm sharing my work as I ask the following question: to what extent is it fair to blame the SNP for the worrying trends in Scottish pupils' educational attainment? 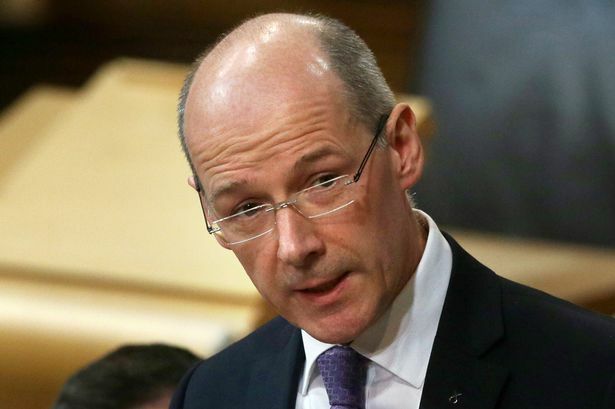 There are issues that pre-date the SNP's leadership and there are issue that are UK-wide, so I want to see if there is sound evidence that the SNP themselves have made decisions to de-prioritise education. First of all a bit of house-keeping. 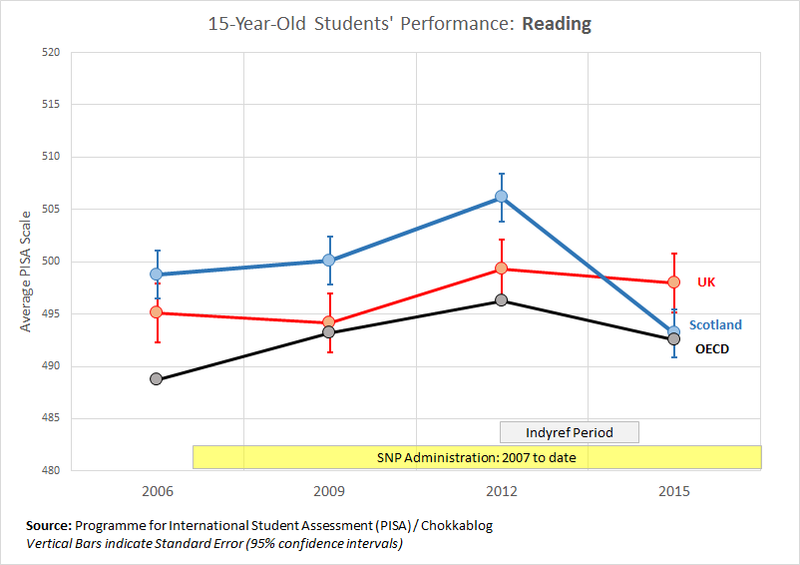 In my recent blog Judging the SNP on Their Education Record, I'd labelled some SSLN graphs as being "Literacy" attainment when in fact they were just the Reading element of Literacy. 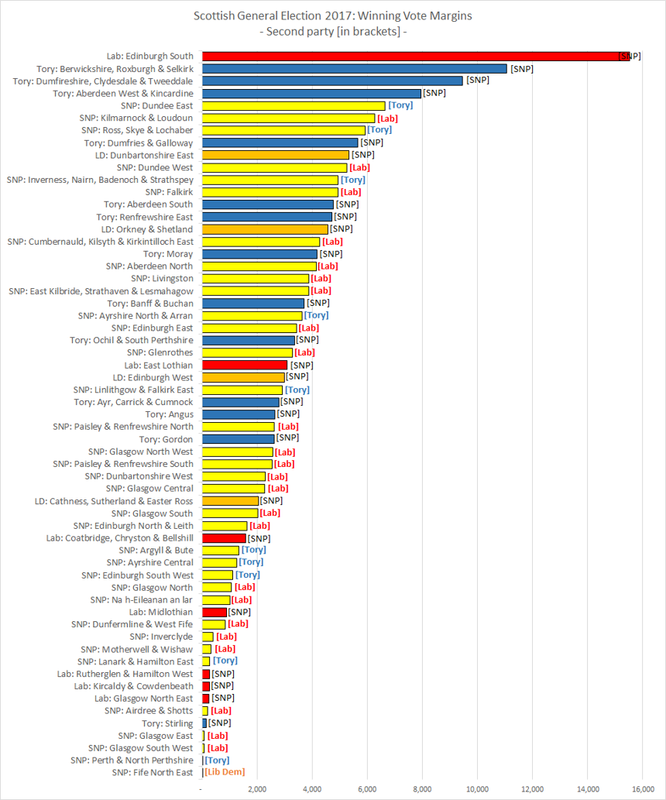 For completeness then, here is the full set of graphs for Numeracy, Reading and Writing*. 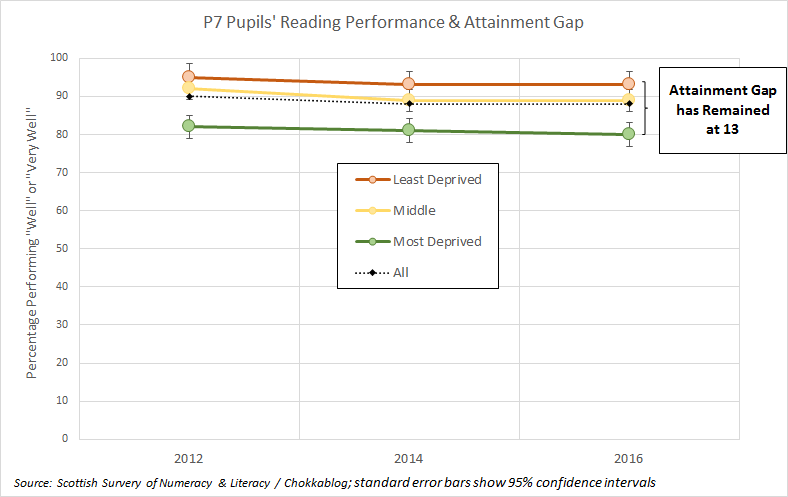 To read these graphs: the dotted black line shows the overall performance over time, the gap between the red (least deprived) and green (most deprived) lines illustrates the Attainment Gap. 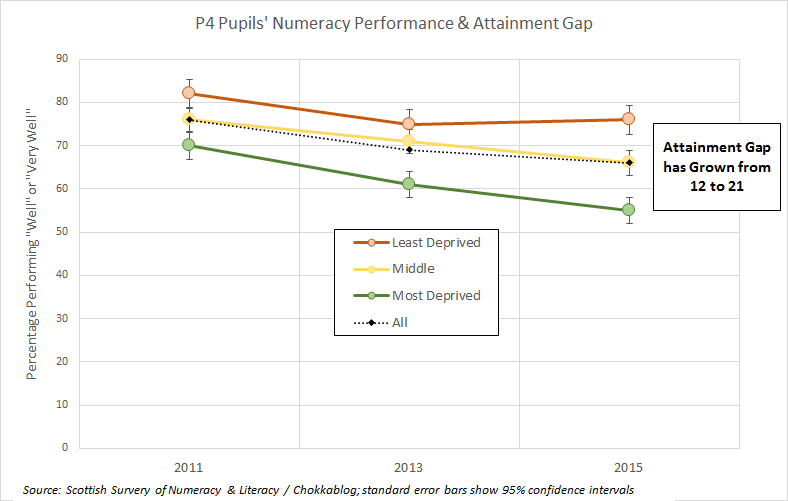 Little evidence of sustained improvements in Reading & Writing and a worrying drop in Numeracy performance particularly among children from the most deprived backgrounds. 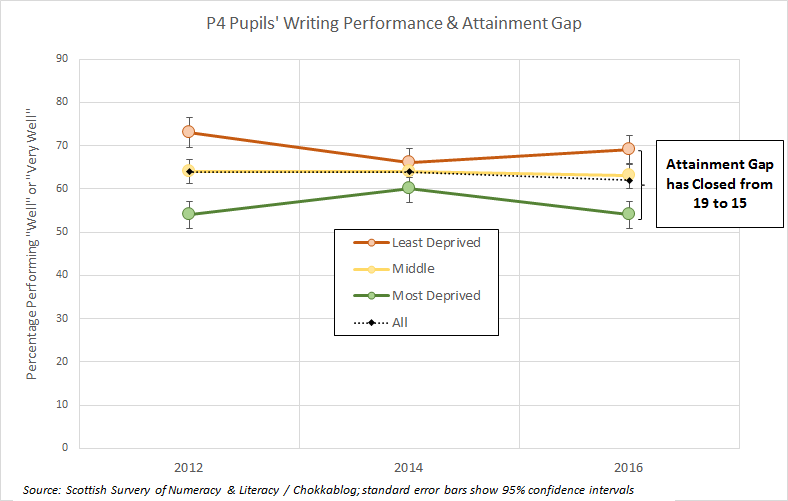 Reading performance stable and with a relatively small Attainment Gap, but declines in Writing and Numeracy performance, along with widening Attainment Gaps. 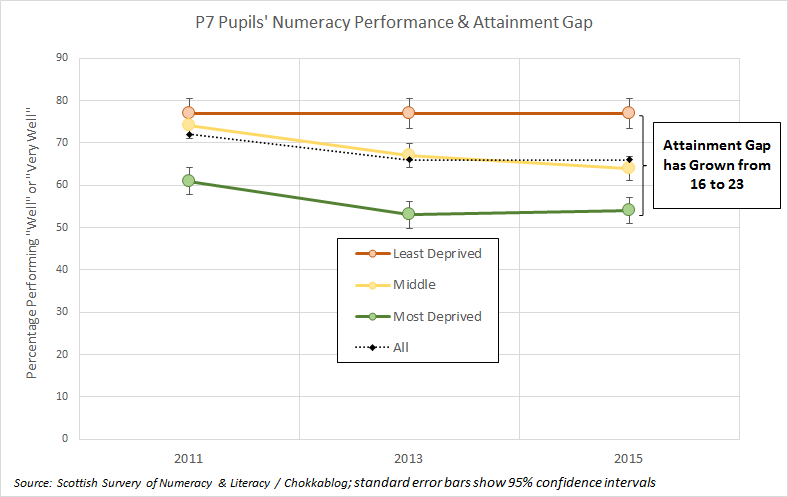 Reading performance relatively stable, with no sustained progress on closing the Attainment Gap. 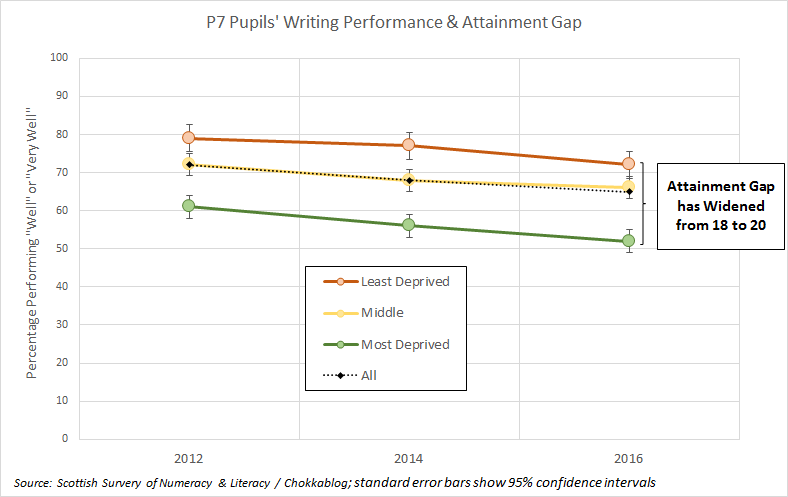 Dramatic decline in Writing performance, with the Attainment Gap only slightly narrowing because of faster decline in performance by pupils from least deprived backgrounds. 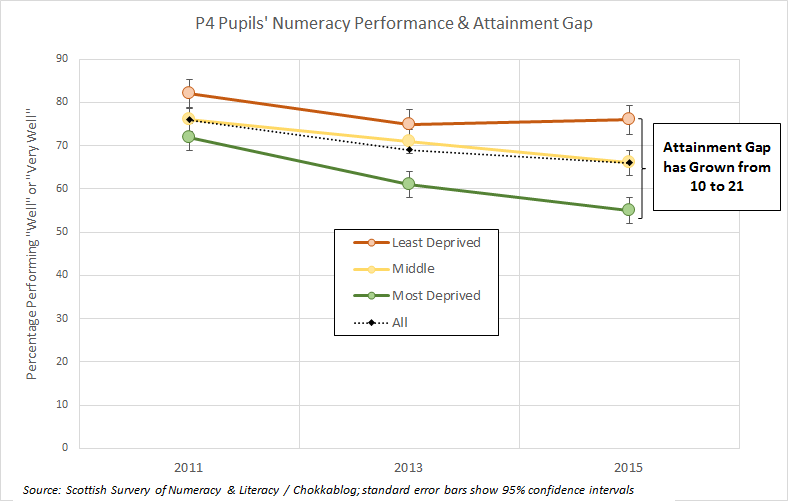 Numeracy overall stable at a low level of performance and with no progress in closing what is the largest Attainment Gap of all. 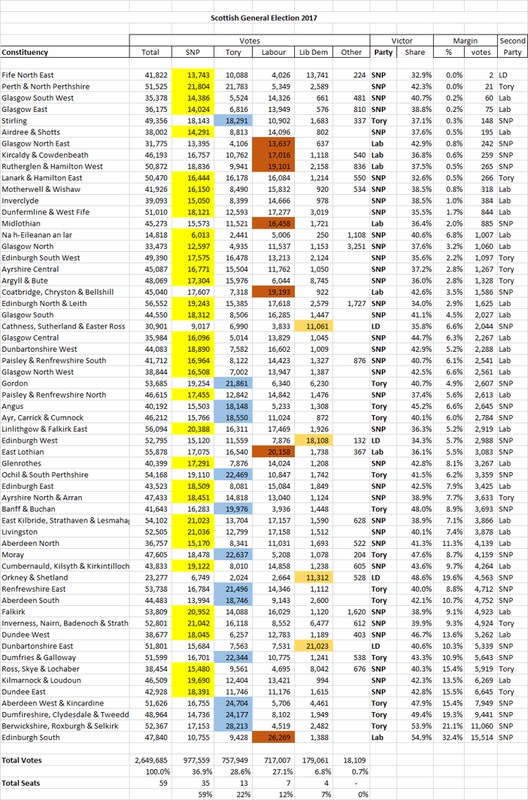 OK, so that's tidied up the evidence on performance. 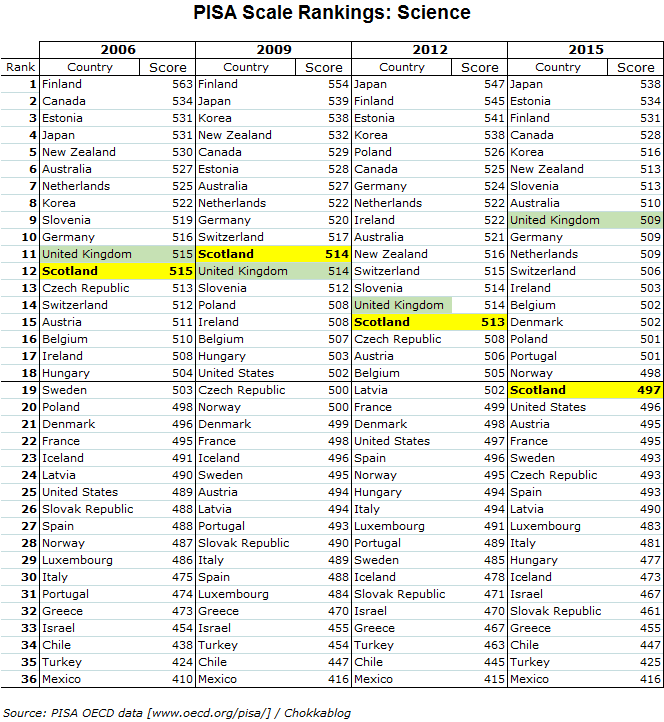 Combine the PISA data from the previous blog post with the SSLN data and we can fairly conclude that, overall, standards are slipping and Attainment Gaps remain high and are growing more than they're closing. Something's going badly wrong. So what evidence do we have that the SNP have taken actions that have caused this? There are of course questions about the wider strategic approach with the Curriculum for Excellence, but I'm focusing here on hard, objective data. 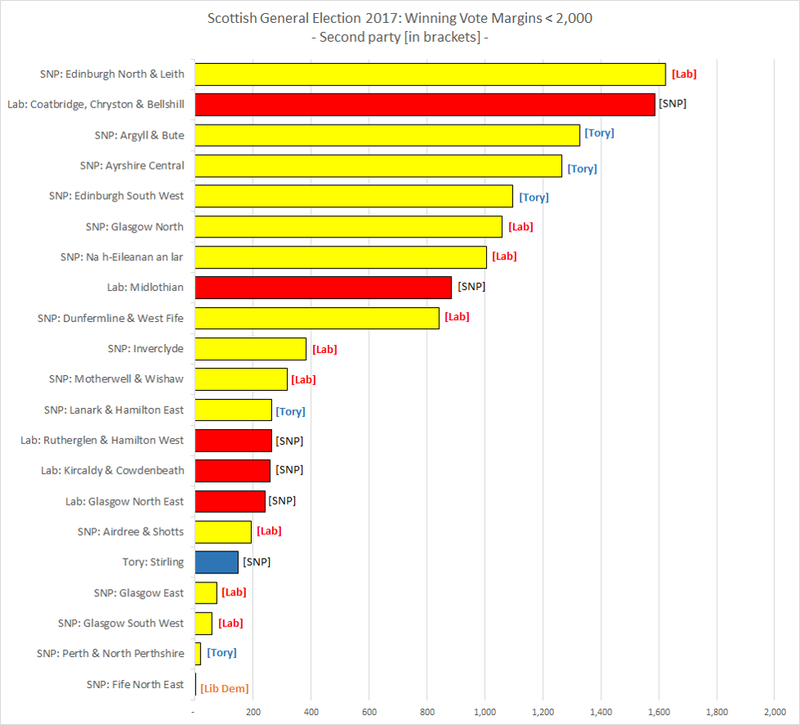 In particular I'm looking to see differences between Scotland and England, as that provides evidence that what we're seeing here can't simply be dismissed as the knock-on effect of "Tory Austerity". 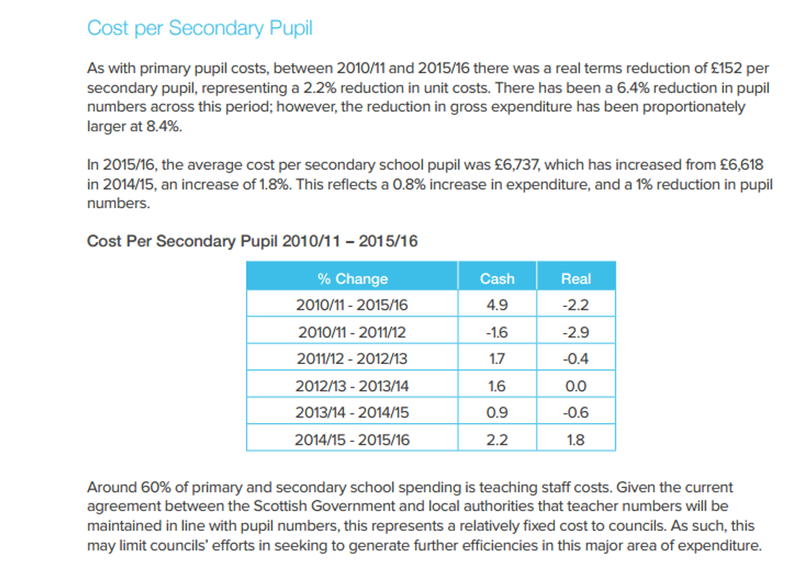 Using our old friend the GERS figures, we can look at the different trends in spending on education and training (i.e. more than just schools) between Scotland and the rest of the UK. 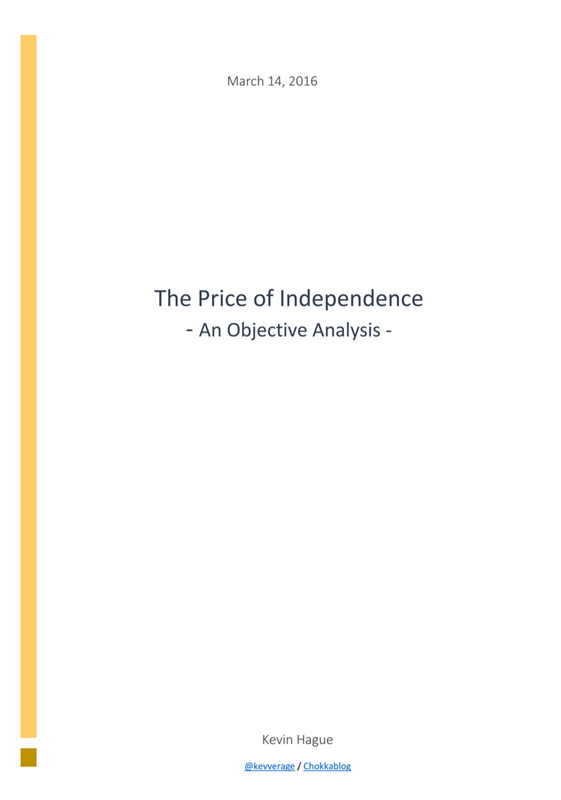 Given the Barnett Formula ensures that Scotland has the capacity to maintain spending in this area in line with the rest of the UK, any decision to pursue a different path is the result of SNP policy decisions. 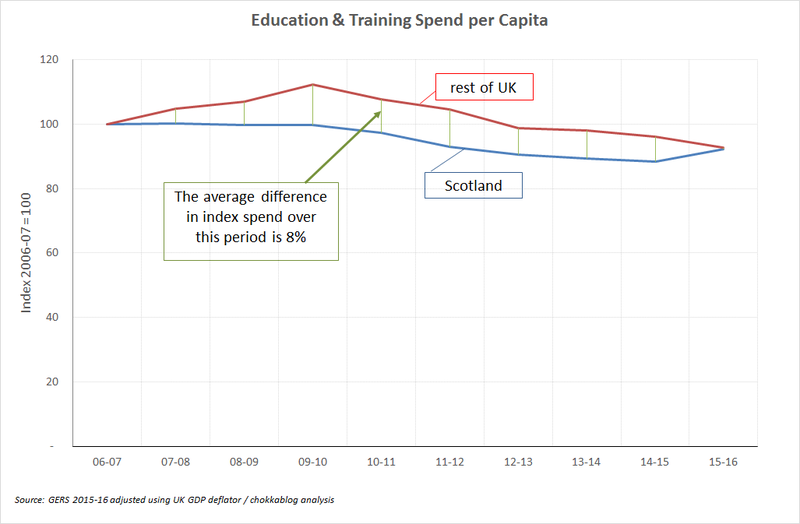 If we look at indexed spend per capita we can illustrate the trend differences between spending on Education & Training in Scotland and the rest of the UK. It's not just how much that has been spent of course, but what it's been spent on. 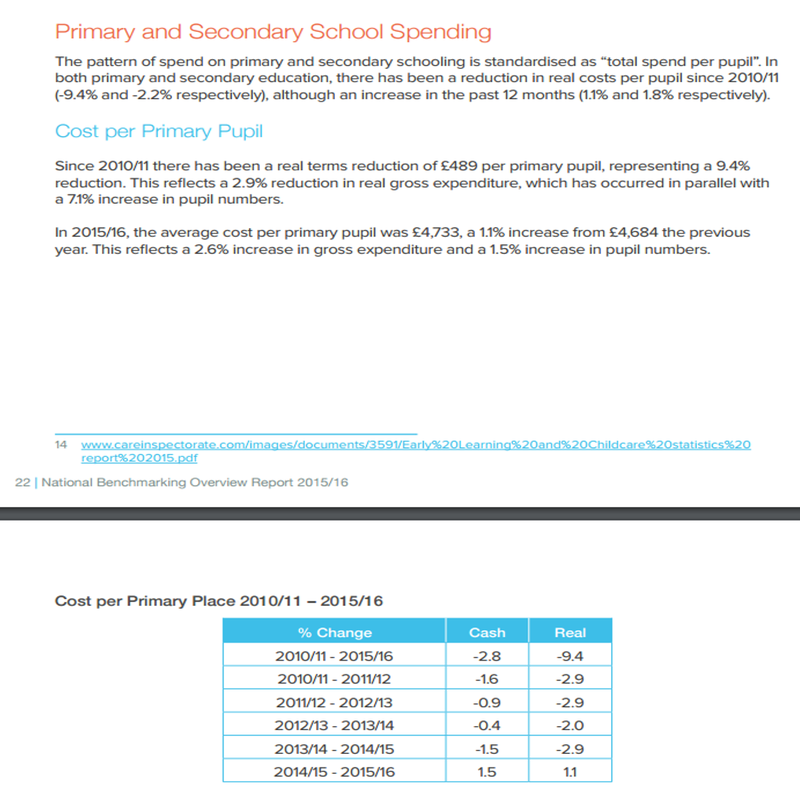 We know the Scottish Government chooses to spend some education & training money to support their flagship "no tuition fees" policy for example - so let's looking at schooling specific spend. 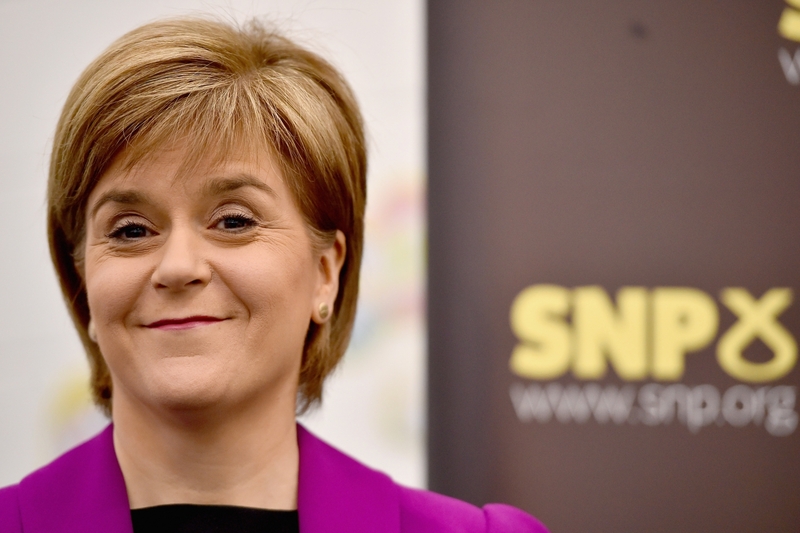 To summarise: the SNP have cut spending on education & training in Scotland over the last 9 years by on average 8% more than it's been cut in the rest of the UK. 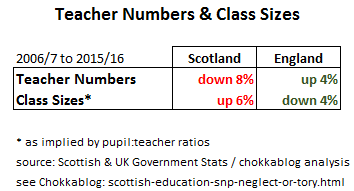 Unsurprisingly, over the same period teacher numbers in Scotland have declined (by 8%) and pupil:teacher ratios (a proxy for class sizes) have increased (by 6%). 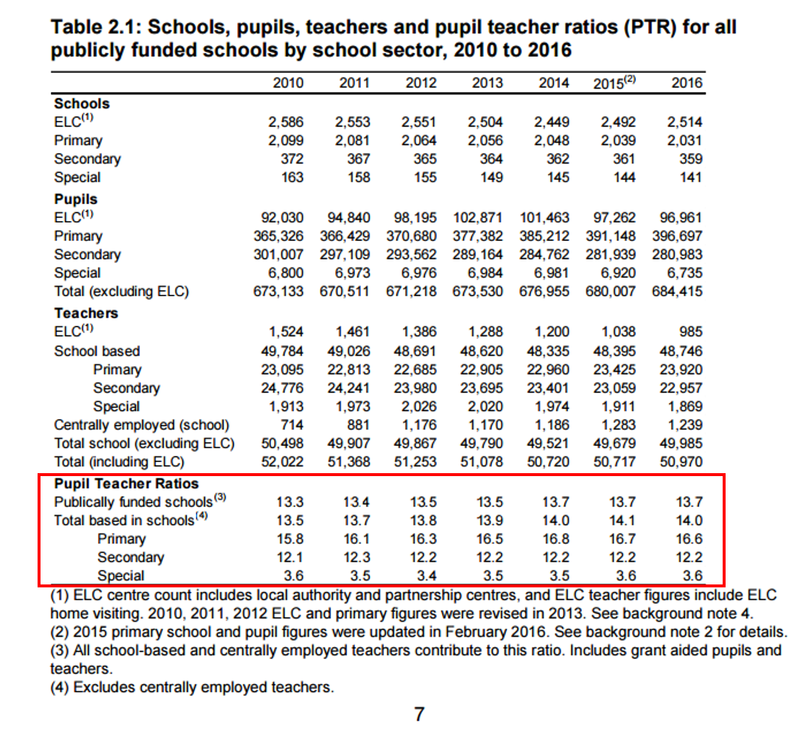 The reverse has happened in England, with teacher numbers up (by 4%) and pupil:teacher ratios improving. 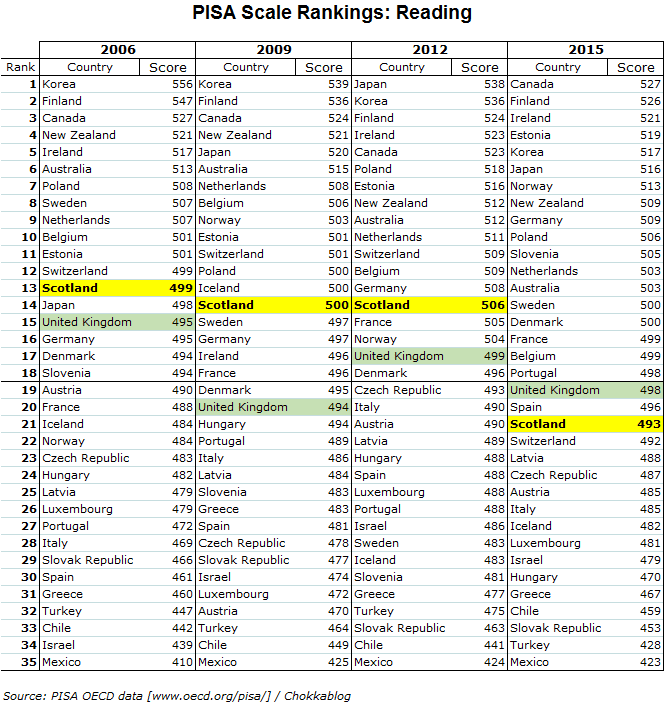 The Barnett formula ensures Scotland has the option to follow the rest of the UK when investing in schooling; the hard evidence shows that the SNP has simply chosen not to. 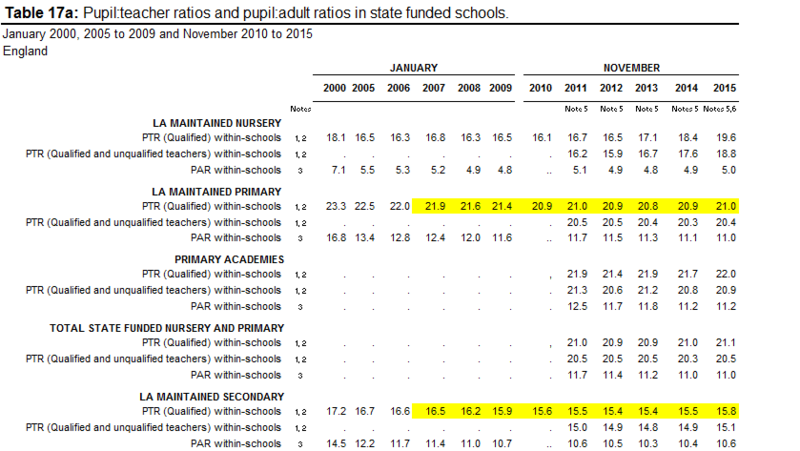 The area worst hit in terms of teacher numbers and pupil:teacher ratios has been Primary school education. If we rely on school-leaver "tariff scores" and exam passes to measure our education system's performance, it will be a long while before the true cost of these cuts is seen. One of the factors driving the decrease in teacher numbers in Scotland has clearly been a failure to train enough teachers. 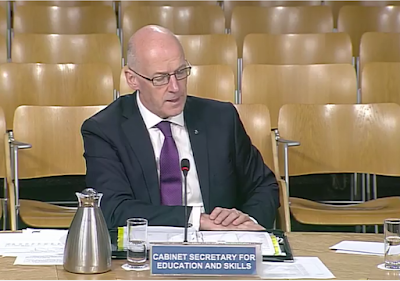 Witness this recent exchange between Daniel Johnson and John Swinney at the recent Education and Skills Committee (31 May 2017). 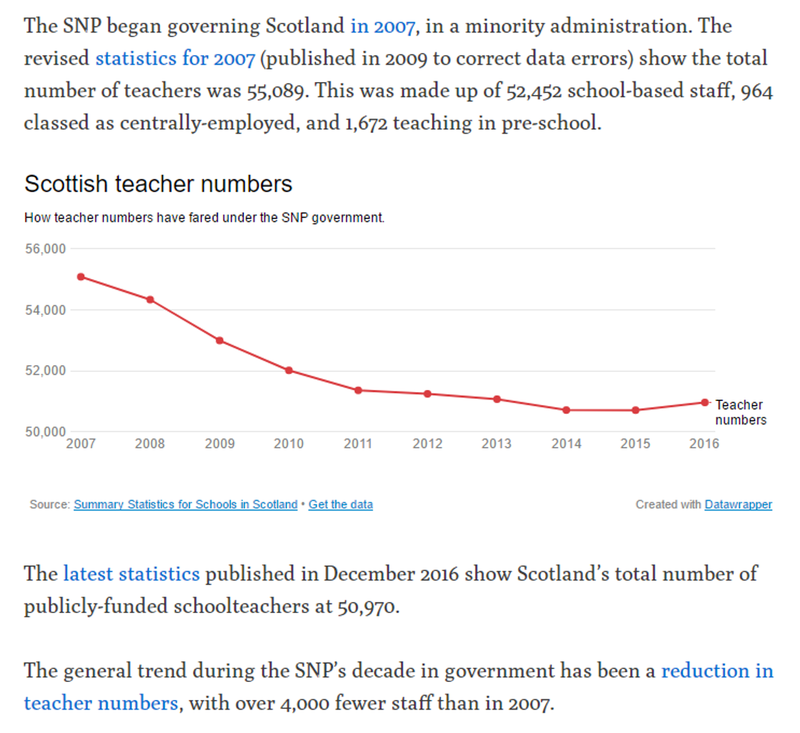 In summary: Daniel points out the target numbers for student teachers nearly halved from 4,437 in 2005/6 to 2,300 in 20011/12 and we currently have 700 teacher vacancies - the SNP has simply failed to train enough teachers. 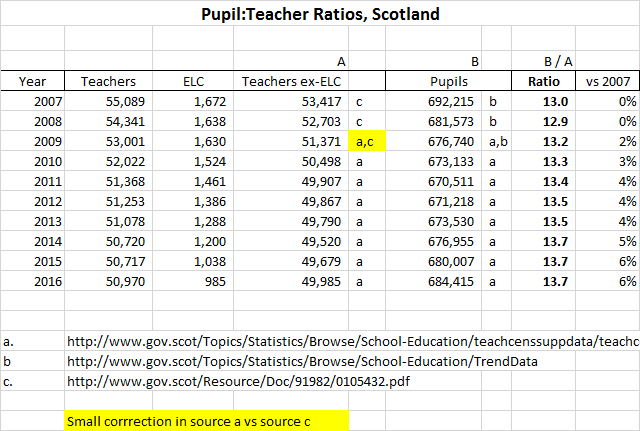 "Clearly with the benefit of hindsight the intake number in 2011 was probably over-corrected too far ..."
I started this rambling blog by asking the question: to what extent is it fair to blame the SNP for the worrying trends in Scottish pupils' educational attainment?